Residence dei Fiori is located on the Ligurian coast in Italy. This location is ideal for everyone whether you are a group of friends or a have children and are looking for a family holiday. Guests have use of the facilities located at the hotel including a swimming pool, outdoor play area, table tennis, desk football, children's playroom and much more. Perfect for a beautiful holiday by the sea. 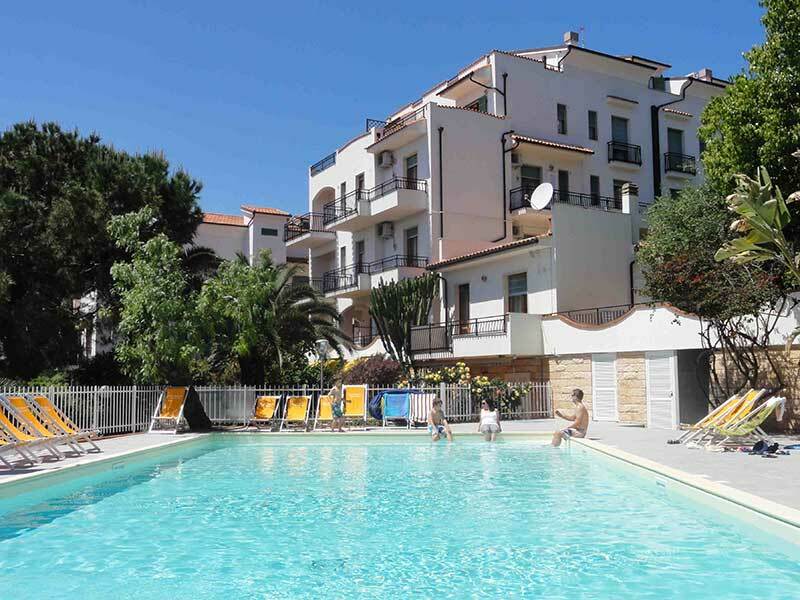 Residence dei Fiori is situated in the heart of the Riviera delle Palme. A sunny oasis of calm surrounded by a lush garden of palm, olive and pine trees on one of the most beautiful stretches of coast in Italy, just a stone’s throw away from Pietra Ligure,10/15 minutes walk from the old town, 1km mt by car or by shuttle-bus. For a wonderful holiday are available : swimming pool, a sun terrace, a heated whirlpool always, fitness room, bicycles, lounge, bar, billiards room, outdoor play area with table tennis , table football , slide, swings, and a ... equipped games room for children. Bike parking room. Apartments of different types and sizes : ranging from the classic 2- room apartment to 4-room apartment that are a real home from home. The spacious apartments are cosy and bright and furnished with attractive modern and practical furniture. You will find every home comfort. All the apartments are equiped with Air Conditioning (Autonomous System), microwave, TvLed, safe, telephone, wi-fi, air dryer. All balconies, terraces or gardens are furnished with table, 2/4 chairs and 2 sun-chairs. All apartments have either a balcony, terrace, garden or porch for your exclusive use, furnished with table, seats and sun loungers - where you can wile away the long summer evenings or dine al fresco. Many of our apartments have a breathtaking seaview. While others face inland over the rolling hills and ancient town of Ranzi and yet others overlook our pretty terrace filled with flowers.evenings or Just outside the door you’ll find Liguria’s magic waiting for you: explore the countryside, taste the local specialties, or choose from a wide range of cultural and sports activities : cycling, climbing, trekking, paragliding, mountain biking, diving. To make your stay more comfortable and enjoyable: Laundry room with washer, dryer and ironing facilities.